The onsen domes are part of our new accommodation for 2019. They take year-round comfort and engagement with the outdoors to a new level. 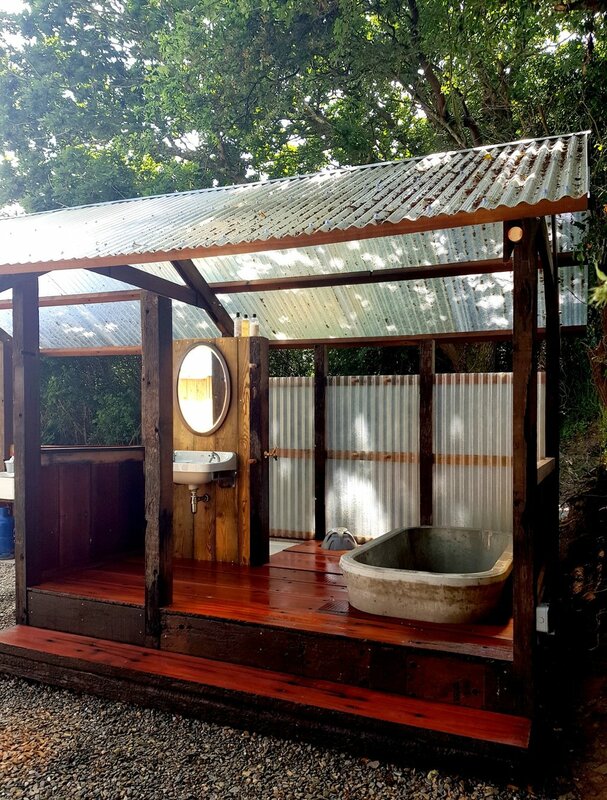 The outside is where the magic really happens as they each have a Japanese style outdoor bathroom complete with shower, basin and sunken, cast concrete Oforu soaking tub for two. We’ve created an insulated cedar and zinc clad pod, connected directly to the Dome with en-suite shower room and WC, together with an indoor dining area featuring power sockets and a fridge. The sleeping area has a king size bed, two futon camp beds and a cosy wood-burning stove. Outside each will have a Japanese style bath-house with shower, basin and cast concrete soaking tub. There will be a fully equipped outdoor kitchen and dining area custom built from reclaimed hardwood with combined outdoor wood-burning stove and barbeque. The Onsen Domes are part of our new accommodation for 2019. Everyone loves our domes - the solid wood floors, wood-burning stoves, bespoke furnishings and beautiful countryside views from the giant bay window. We've designed the Garden Rooms to provide simple, characterful accommodation with flexibility for families, friend & couples. They are in an idyllic setting in the farmyard area with their outdoor kitchen & seating area overlooking the raised bed gardens in the farmyard and adjacent to our newest showers and WCs. The three bedrooms sleep 6 across two double bedrooms (can be converted to twin beds) & one twin bedroom. 5x8m Tent pitch for max of 8ppl. As many tents as you like in the pitch. 5x8m Campervan pitch for max of 8ppl. Suitable for Camper and awning/tent. Flat grass suitable for pitching. The dome, made famous at fforest, with its solid wood floor, wood-burning stove, bespoke furnishings and the view from that giant bay window. Our Domes each have their own individual surroundings in either a field or woodland setting with the showers/WCs a short walk away. They have a king size bed, two futon camp beds and are set on their own decked area with an equipped camp kitchen & seating area. Simplicity, luxury, beauty. But still outdoor living. Our Crog Lofts combine your home comforts like underfloor heating and a private bathroom, but with an outdoor kitchen & seating area so you still get that feeling of being outdoors. They are in our farmyard area, overlooking a large lawn area. The fforest katacabins are a tent with the solidity and comfort of a woodland cabin. With five futon camp beds, a woodburner or gas stove & lighting, all docked onto a fully enclosed kitchen and dining pod. The Kata cabins are all located along the field boundaries tucked into the trees, bushes and wildflowers. Each kata deck has plenty of room for lounging and offers uninterrupted views of the landscape, with plenty of space out front for children to run around in safety. For 2019 our campshacks will be completely new, with solid bedroom pods rather than canvas and lined with pine panelling inside, so highly insulated. The two sleeping pods are flexible to accommodate couples, families or friends, each with a custom built double bed (can be converted to twins) & two bunk beds. Each sleeping pod can be independently accessed from outside too. We've sited the three campshacks in their own field looking out west across the valley. The simple tent for those who want tradition and to stay true to pure. The Bell Tents are all located along the field boundaries tucked into the trees, bushes and wild flowers. Each bell deck has plenty of room for lounging and offers uninterrupted views of the landscape, with plenty of space out front for children to run around in safety. Inside are futon camp beds & a wood-burning stove.